Enjoy the best Italian wines. It is impossible to characterize Italian wine. From the Italian Alps to the island of Sicily the terrain produces a vast amount of grapes along with an equally broad amount of diversity, all of which has evolved throughout 3,500 years of constant husbandry. 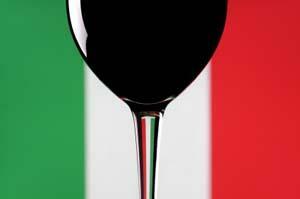 Italy produces and exports more wine than any other country in the world. Like all Western European wine producing countries, the Italian government has instituted a set of regulations designed to protect quality. At the top of the heap are the DOCG or Denominazione di Origine Controllata et Garantita. Below this ranking are the DOC or Denominazione di Origine Controllata wines. Generally these are the wines that are exported abroad. These labels are supposed to guarantee a certain authenticity relative to the region where they're produced. To earn this label the wine must adhere to a set of minimum regulations, which vary according to the regional specifications. Below these two are the IGT or Indicazione Geografica Tipica classified wines, which generally mean that the wines are authentic and typical of the broad region from which they originate. One anomaly in this particular classification is wine of high quality that uses non-typical grapes or modern wine-making techniques. Thus, some of Italy's most expensive wines, such as the Super Tuscans, share the same ranking as simple country wine. This has produced much controversy and presumably in the future a new separate category will be created for these high-quality non typical wines. The lowest denomination are the wines considered Vina da Tavola, which is rarely found outside of Italy. Italy has 20 distinct wine regions that roughly can be divided into four geographical zones. Within this zone are the three regions: Veneto, Trentino-Alto Adige, and Friuli-Venezia Giulia, which are known collectively as the Tre Venezie. Veneto is Italy's largest producer of D.O.C wines. All three regions are affected by the Alps which shield the zone from the cool, damp European weather. Winemaking here is characterized by modern efficiency relative to other Italian regions. This adherence to quality standards has paid off with a booming export market for the Venezie. Like all of Italy, a wide variety of grapes are grown here with many native as well as international varietals. Some of the best known regions within this zone are Soave, Valpolicella, Bardolino and Prosecco. This zone contains six regions: Tuscany, Umbria, Marches, Abruzzo, Latium and Molise. The Sangiovese grape reigns supreme throughout this zone. Tuscany is without a doubt the most well known region within this zone with Brunello di Montalcino, Vino Nobile di Montepulciano and the ubiquitous Chianti. Exploring the wine of Italy is a lifelong journey that would require several lifetimes. Many of the exported wines are considered the best that a certain region has to offer but those who have traveled in Italy may disagree as many Italian wines are never exported. Considering that Italy is around the size of California, it's pretty impressive to consider that Italy makes the most wine, exports the most wine and also drinks the most wine.